Earlier this week I posted my big DIY headboard that I made out of old wood. You can check that post out here if you haven't seen it yet. I really wanted lights installed on my headboard to free up table space on the bed side tables. I feel like the bed side tables have a big habit of collecting random clutter. Books, remote controls, chargers, cell phones, tablets, pens, notebooks, my daughter's bracelets and hair ties/bands...the list goes on and on. So, getting at least one things off of the table is a huge help in reducing clutter - which is my overall goal for my house. Some people are lucky enough to have recessed lighting, or hard-wiring their lights which are mounted on the wall or headboard. Well, I'm not that lucky. 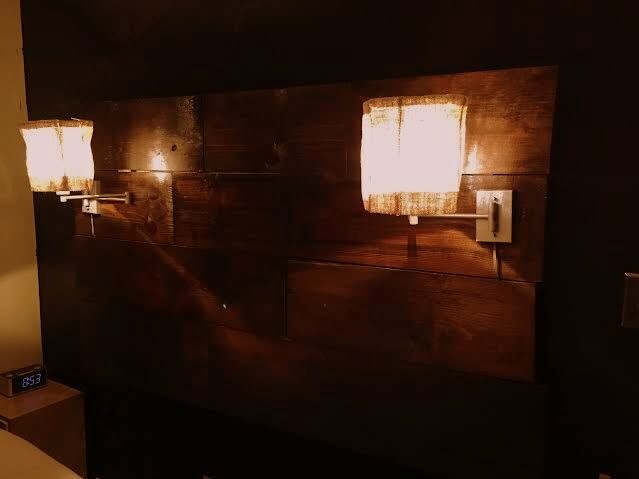 I knew that there had to be wall-mounted lights that can be plugged into an outlet out there somewhere. Okay. Let's take a gander at this light for a moment, shall we? I hate the brass color of the mount. (Notice that they don't show the electrical cord coming out from beneath it (It is brown). White and tapered are super boring. They have swing arms? So the hubs and I could position them where we'd like? I took them out of the packaging and yep. I hated the color of them. 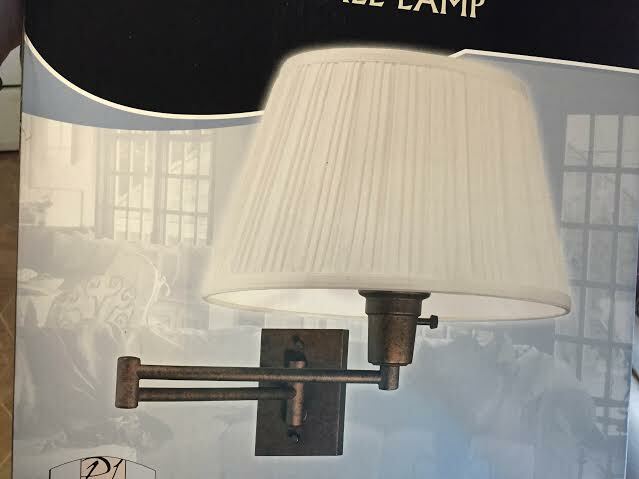 They were a dark brass color with a textured look. Then I remembered I happened to have a can of spray paint in silver...which looks like metal when sprayed on. Hammered metal spray paint is available in a couple colors, and silver is just my personal favorite. So I laid them down on plastic in the garage, gave them a couple good coats of the paint (including the lampshade hardware, without the shade on it). I knew right away when I purchased them that I had to do something different with the lampshades. I like drum shades much better. But nothing was available with the right kind of fitting to fit on these. I checked Menards, Walmart and Target. My friend suggested just wrapping burlap around the shade. 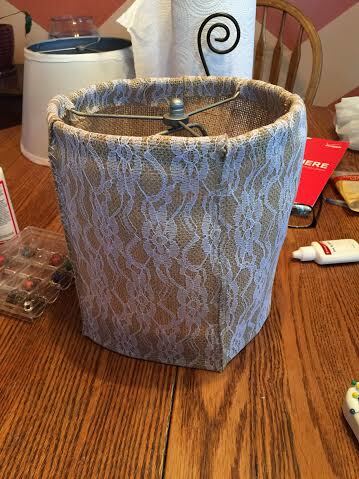 I rummaged around and found a roll of burlap with a lace overlay on it that I picked up for under $4 at Walmart one day and never gave it a second thought. I then tore apart the lampshades (sorry I didn't take any pictures because at the time I didn't know what the heck I was really doing or how this would end up). 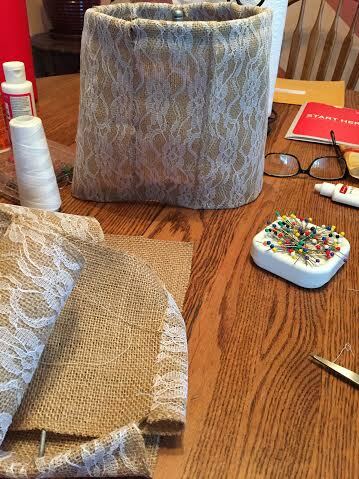 I then started cutting the roll of burlap. The burlap is about 3 inches wide and I cut the it into strips about 8 inches long. Then I curled one end of the strip around the top ring of the lampshade that I saved, and sewed it in place using just white thread and a needle. I repeated this with a second strip but then after I whip-stitched the strips together. 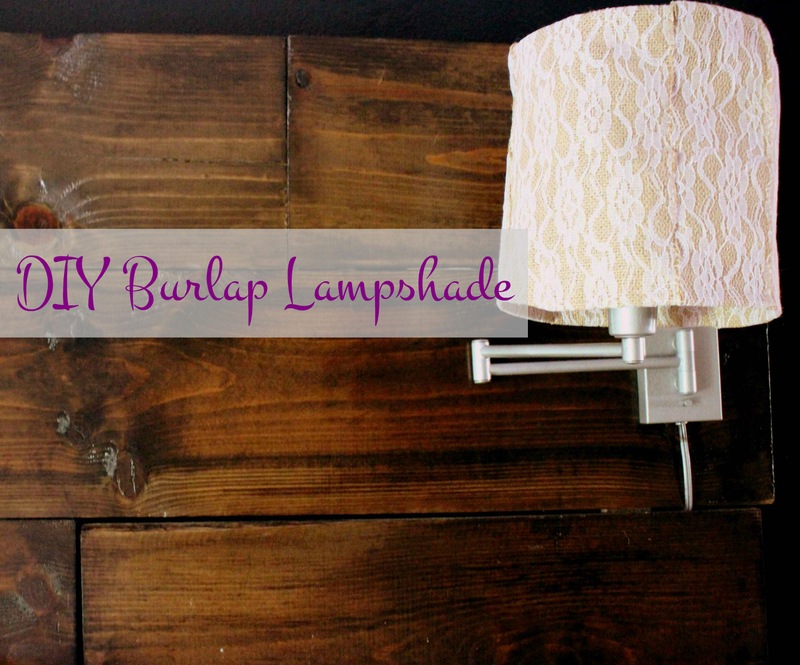 I kept repeating this until the entire shade was covered in burlap. In hindsight, I would have sewn all the strips together first, but I didn't know what I was doing at the time...I was just experimenting and then I ended up liking it enough to keep it and do it to the other shade. After all were in place, I hemmed up the bottom, put it back on the lamp and I had two, simple, and totally inexpensive lampshades that I like SO much more than the ones that came with the lamps. I bought iridescent lights to go in, because they give off a nice glow, and a low wattage (bed lights, remember). We then mounted them on the headboard once we had it installed. I didn't know how far over from the edge we would want them, or how high or low we would...so we just waited and I was so happy with the result! Since they are not hard-wired into the wall, I slipped the cords into the purposefully left gaps in the headboard and dropped the cords behind the wood down to the plug-in. When they aren't turned on, the lace really makes them pop, at least I think they do! That's all it takes. They were very inexpensive to make, and I could have really spent more time on them if I had planned out what I was doing. Maybe I'll remove them and give them a quick run through the sewing machine, but for now, I am pleasantly pleased with them!